Moore Games Affiliate is closed. Warning: Moore Games Affiliate is not recommended for player related payment problems and having an invalid gaming license. See other casino affiliate programs you can work with. Moore Games Affiliate is the casino affiliate program for Mooregames.com. The program is based in Curacao and uses TAIN gaming software. This program is not recommended at the moment as it has been pointed out to Gaffg that the casino has retroactively changed the terms and conditions of their bonus and confiscated player funds in the process. 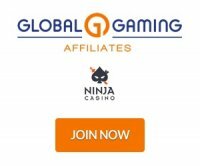 The affiliate program lists a 20% revenue share commission rate across their sportsbook, casino and poker games. The website mentions the commission increases but doesn't say by how much and in which circumstances. The program has standard banners to promote all of their gaming products as well as tracking links. This program should be avoided as their Curacao gaming license is invalid as of May 14th, 2013.